David Sereda's "The Voice : The Cosmos and The Quantum Universe"
From the auras of atoms, DNA, plants and humans we explode into the auras of planets, the great spheres, stars and the cosmic beyond all the way to the big sphere or field of God Consciousness. We explore how these great spheres actually exist in science and how consciousness accesses the fields to gain greater knowledge and transcend all suffering. We meet the great enlightened masters of the past and the masters of today to find out how to get our small limited aura to expand into these greater fields to gain true insight, knowledge and wisdom so that humanity can attain true success and evolution. Einstein said “the field is the only reality.” When he discovered “Spooky action at a distance,” he even found that the field is alive, that consciousness pervaded it. Artists, scientists, musicians, poets and all human beings can attain true success by gaining access to the greater fields and learning how to meditate; for it is in the fields that we get true knowledge for any question we have, including the cure for cancer and the answer to non-radioactive nuclear fusion. By deepening our understanding of reality in any given career or field, we can become more successful in our lives. This happens in everything from career, finance and to relationships. This is because we gain greater knowledge of how the universe and the physics of the soul works. Albert Einstein: "What humanity owes to personalities like Buddha, Moses, and Jesus ranks for me higher than all the achievements of the inquiring and constructive mind." When the Dalai Lama was asked if he is enlightened, he said "no." This is because true enlightenment is like a supernova of Love, Ecstasy, Peace, Power, Beauty, Wisdom Knowledge and Grace that explodes from within and merges the small human aura into 9 potential cosmic fields of consciousness that go from the earth, solar system and the cosmos beyond. Nirvana begins at the 7th level of Heaven, Jnana or Samadhi, Super-consciousness. The Dalai Lama is an emanation of a Bodhisattva named Avaloketishvara. Bodhisattvas will intentionally withhold going from the 6th to the 7th to ensure service to all sentient begins. Once a person crosses the 7th veil, they do not return in another life, for they have attained a level of realization beyond the veil of humanity! From Enoch, to Moses, Krishna and Radha, Rama and Sita, Buddha and Yasodara, Jesus and Mary, Padma Sambhava the Buddha and Yeshe Sogyal, Dante Alighieri and Beatrice, Muhammad, and all the great sages, few have crossed the 7th veil. As all the great masters found their soul mate, we explore the physics of the soul and learn how we can find our own divine soul mate and life partner. Find out how the physics of the soul really works. 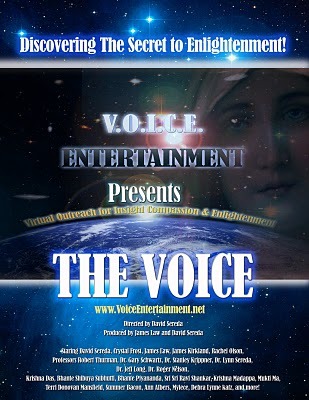 This film will show you what the experience of enlightenment really is and how you can begin your journey or deepen your existing journey to your true self in the cosmos. The website also sells meditation cds instructed by David Sereda to show you how to learn to meditate, deepen your experience of your true self and gain access to the spheres of God Consciousness. Einstein said, "Science without religion is lame. Religion without science is blind." That is what this film is about. Spirituality, religion and science are merging together into a single place! In this grand marriage of the two, we can hear the voice of a new kind of wisdom that will not threaten our view of God, but will only deepen our understanding. To help us answer the deepest questions human beings face: What is consciousness? How does consciousness truly affect reality? How does mind over matter actually operate? To know the science of consciousness is to know how to reach a true and authentic enlightenment! Science also gives us a reliable model that we can use again and again that will never fail us. What is the experience of true enlightenment actually like? Find out what experiencers are actually telling us! Find out how you can experience the enlightenment of the ages now! From the ordinary people having extraordinary spiritual experiences, to the saints, the consciousness explorers, to the new scientists, the vision and experience of true and authentic enlightenment is upon us !